FULTON, NY – The Fulton Lions Club inducted Jeff Sawyer and Melissa Champion as members at its Sept. 17 meeting. The Fulton Lions Club inducted Jeff Sawyer (second from left), and Melissa Champion (second from right), as members at their Sept. 17 meeting. “We are delighted to have Jeff and Melissa join our club,” said President Paul Foster. 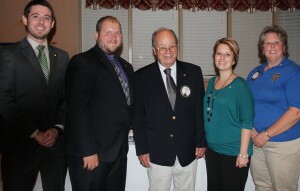 “As our club grows, so does our ability to reach and help more people in the greater Fulton community.” Past President Leo Chirello (center), conducted the member induction ceremony and sponsors for Sawyer and Champion were Zachary Merry (far left) and Immediate Past President Gail Holmes, (far right) respectively. In addition to the member induction, the club also presented a donation to Guiding Eyes For The Blind in remembrance of Past President Donald “Charby” Charbonneau, who passed away earlier this year, Foster said. “Our gift to Guiding Eyes was the donations received in Don’s name for our club.” The Fulton Lions have sponsored a Guiding Eyes Labrador Retriever named Charby, and also renamed their annual duck derby, Charby’s Duck Derby, in honor of Charbonneau who created the event 25 years ago. The Fulton Lions Club presented a donation to Guiding Eyes For The Blind in remembrance of Past President Donald “Charby” Charbonneau, who passed away earlier this year, at their Sept. 17 meeting. 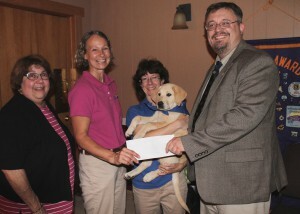 Past President David Guyer presents the donation to Cynthia Swift, Guiding Eyes trainer. Joining them are, from left: Patti Charbonneau, Donald’s wife; Mary Oonk, Guiding Eyes trainer; and Kimberly, a 13-week-old Yellow Labrador Retriever in training. The Fulton Lions have sponsored a Guiding Eyes Labrador Retriever named Charby, and also renamed their annual duck derby, Charby’s Duck Derby, in honor of Charbonneau who created the event 25 years ago. Cynthia Swift and Mary Oonk, dog trainers for Guiding Eyes, made a presentation with Kimberly, a 13-week old Yellow Labrador Retriever in training. Guiding Eyes For The Blind is a nonprofit organization that provides guide dogs to people with vision loss, as well as service dogs for children with autism. All services are provided free of charge. Past President Leo Chirello conducted the member induction ceremony and sponsors for Sawyer and Champion were Zachary Merry and Immediate Past President Gail Holmes, respectively. Fulton’s Lions Club, also known for its Lions Loot Sweepstakes and Lions Mane Event Comedy Night, provides financial assistance for those in need of eyeglasses, eye exams, and hearing aids to residents in the Greater Fulton area.